Hello! Happy Wednesday! A friend of mine asked me to make a First Communion card for her niece. This is the first time I've made something for this occasion, so I wasn't sure where to begin. She said something pretty with a cross would fit the bill, so this is what I came up with. I e-mailed her a picture and she loves it~YAY! Well, I have been taking my 3 year old to swim lessons this week. He totally freaked out and cried for the full 15 minutes on Monday, but yesterday, he was swimming from his teacher to the side and laughing. Hopefully today will be like yesterday! Thank you so much for stopping by and have a wonderful day! This is gorgeous, Kerri. So warm, rich, and beautifully designed. 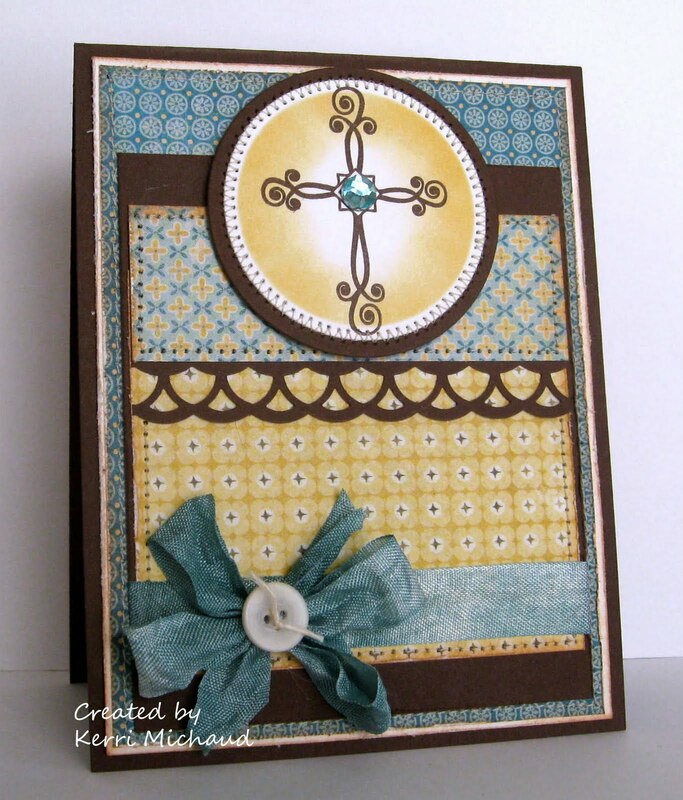 Kerri, this is beautiful Love the colors and layout. Gorgeous card! No wonder why your friend liked it! Have fun at swimming lesson! OMGoodness, who wouldn't love this card? It's gorgeous! I love those papers together! Yes, Kerri, I'm a little worried about the 24 as well - lol! He moved up several spots last week, but I'd breathe a whole lot easier if he was already in the top 10! Your card turned out just BEAUTIFUL! Kerri this certainly does fit the bill it is gorgeous! BEAUTIFUL!! I love the "shine" you created in the center of the cross. Fabulous layout. I need to sign my kiddos up for swim lessons...are you doing private or at the YMCA?